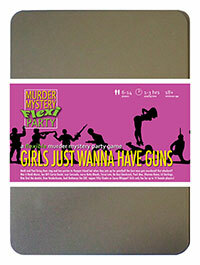 You've been invited to play the role of Betty Bleeds in Girls Just Wanna Have Guns. Heidi and Paul are throwing their pre-wedding parties at luxury spa and adventure resort, Pamper Island. But after one too many drinks, the bride and her entourage are invited to 'hunt the stag' with paintball guns - and best man Steve Wingman meets a grisly end! Can you find out who murdered him? Grab your guns and get ready for a facial at the luxury spa and adventure resort of Pamper Island! Your nurses uniform is a strange choice for an island getaway but as ! it’s a hen party, it seemed ideal! Undo an extra button, pair it with fishnets and heels, and you’re done. Don’t forget your thermometer! As an only child with elderly parents you had a head start on caring for the infirm. You loved them so much that when they both passed away in a tragic Hungry Man Steak-Eating Contest you sought comfort in comforting others and trained to be a nurse without hesitation. You’ve had your share of romances, both male and female, but have avoided settling down as you feel married to work. I’m Betty, just a nurse, or as I’m more commonly known, an “Angel of the Ward”. If I’d have seen Steve impaled on that tree root early enough I could have fixed him up with a couple of bandages and some Germolene. I’ve just finished a six-month stint in Leicester General’s A&E and in comparison to what I saw there, Steve had a minor flesh wound. Anyhoo, I’ve recently switched to phlebotomy as apparently I like sticking needles in things and drawing blood out.